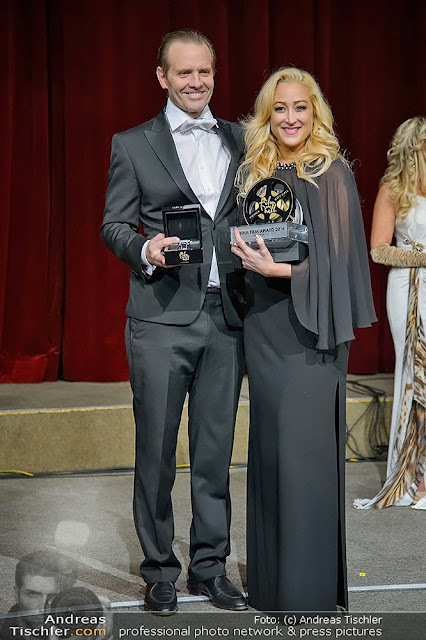 Actress-producer-director Jennifer Blanc Biehn (WRONG COPS, EVERLY, THE VICTIM) and husband Michael Biehn (ALIENS, TERMINATOR, THE VICTIM) were honored the Vienna Film Ball Award for “The Victim” at Austria’s most prestigious film event of the year – the 2014 Film Ball Vienna. The exciting 3-day celebrity-filled event included a press conference, awards ceremony, and the glamorous ball. For more information, please visit http://www.filmballvienna.at/static/ . In recent years, Vienna Film Ball has awarded stars such as Christoph Waltz, Kevin Spacey, Maximilian Schell, and Christopher Lee. At this year’s event, Jennifer Blanc Biehn and Michael Biehn will be joined by actress Daryl Hannah and actor Val Kilmer as honored guests at the Film Ball. The event showcased a special preview of Blanc Biehn Productions trailer reel during the ceremony. For additional information, please visit http://blancbiehnproductions.com/ . Jennifer Blanc-Biehn can be seen in WRONG COPS, currently in theaters, and in Joe Lynch’s black listed script EVERLY, co-starring Salma Hayek and Gabriella Wright, coming soon to theaters.